Nothing says “family” like Thanksgiving, as we gather together in gratitude with those we love to enjoy the simple gift of togetherness. 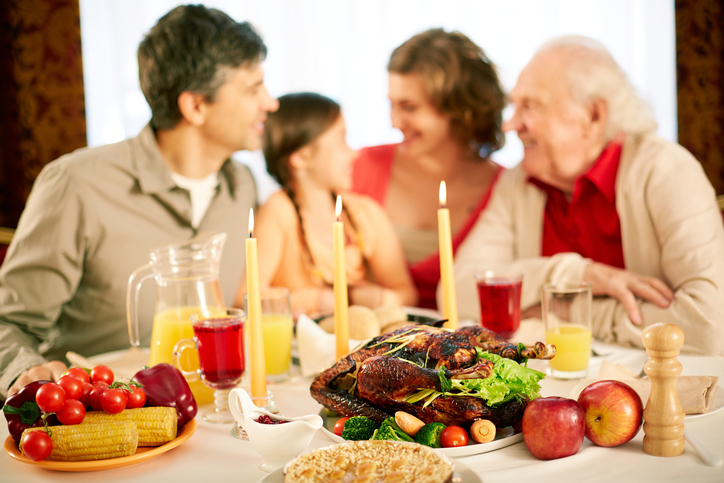 And, as we mentioned in our previous blog post, at the center of the festivities is the classic, lavish dinner that we all eagerly prepare for long before the big day, which can cause health concerns for all seniors, but particularly those with diabetes. Count carbs. It could be tempting for those with diabetes to allow themselves a break “just this one time” from monitoring their carbs, but it’s very important to stay on track and keep consumption of carbs within the medical professionals’ instructions at all times. An assortment of apps are available to make it simpler. Get up and moving! During the holiday season – and throughout the year – exercise is so crucial for those with diabetes. Not only can it reduce the risk of diabetic complications, but it improves how we feel emotionally, reduces our level of stress, and enhances overall wellbeing. Some great suggestions include participating in a game with the kids, taking the dog for a walk, or helping with cleaning up the kitchen. Spending time outdoors, weather permitting, is also beneficial to boosting mood and obtaining much-needed vitamin D from the sun. Take a trip. Seniors with diabetes may be hesitant to venture too far from home, but there are a number of tips to help diabetics travel safely. This checklist provides a means to make sure all necessary diabetic care needs will be met while away. And of course it’s important to pack plenty of healthy snacks, eat meals according to the normal routine, and test blood glucose frequently. If you would like further guidelines on helping those with diabetes or any other chronic disease to remain healthy and thriving at home – before, during, or after the holidays – contact Compassionate Nursing Services’ St. Louis home care professionals. Our in-home care services for seniors can range anywhere from several hours a week of companionship and assistance with household chores to full-time, 24-hour care, or anything in between. Call us at 314-432-4312 to schedule a free in-home assessment to explore solutions for your senior loved one’s individual needs.